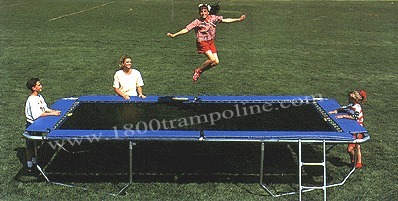 Get the whole family up and jumping on the 10ftx17ft Rectangular trampoline and give everyone their own space to leap. Reach heights you never thought you could with this rebounding device! -10' X 17' Heavy Frame TUF 40 Galvanized PIPE (3"-13ga. 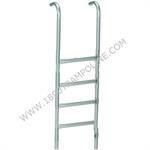 with welded loops for spring attachment) in 8 pieces. -7' x 14' Mat is a Non-abrasive Permatron , includes blue sunscreen stitching protector on mat edge for added protection. -112 - High Tensile, galvanized 9" steel tapered springs for a superior strength and bounce. -Tough 1 1/2" Wide Nylon Straps are sewn with 8 Rows of Triple UV-Coated Weather Resistant Thread on mat. 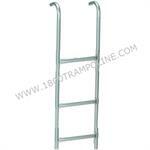 -Deluxe 18 oz., 13" wide x 1" thick Frame Pads Attach Securely to the Frame and Float Above the Springs. -Pads are Constructed of a Heavy duty, Weather Resistant Vinyl. – Measures 3 feet from ground to frame.